The FOX network has already announced some of their new shows for the 2013-14 season. One of the comedies is Brooklyn Nine-Nine and it stars Saturday Night Live’s Andy Samberg and Last Resort’s Andre Braugher. BROOKLYN NINE-NINE From Dan Goor and Michael Schur, the Emmy Award-winning writers/producers of “Parks and Recreation,” and starring Emmy Award winners Andy Samberg and Andre Braugher, BROOKLYN NINE-NINE is a single-camera ensemble comedy about what happens when a detective who doesn’t take anything seriously gets a new “by-the-book” boss who wants him to grow up and respect the badge. BROOKLYN NINE-NINE is produced by Universal Television and 3 Arts Entertainment. The series is created and written by Dan Goor (“Late Night with Conan O’Brien,” “Parks and Recreation”) and Michael Schur (“The Office,” “Parks and Recreation”). The series is executive-produced by Goor, Schur and David Miner (“30 Rock”). The pilot was directed by the team of Phil Lord and Chris Miller (“21 Jump Street,” “Cloudy with a Chance of Meatballs”). Other new FOX shows are Almost Human, Dads, Enlisted, Gang Related, Rake, Sleepy Hollow, Surviving Jack,and Us & Them. What do you think? Based on this limited information, will you give Brooklyn Nine-Nine a chance? More about: Brooklyn Nine-Nine, Brooklyn Nine-Nine: canceled or renewed?, FOX TV shows: canceled or renewed? 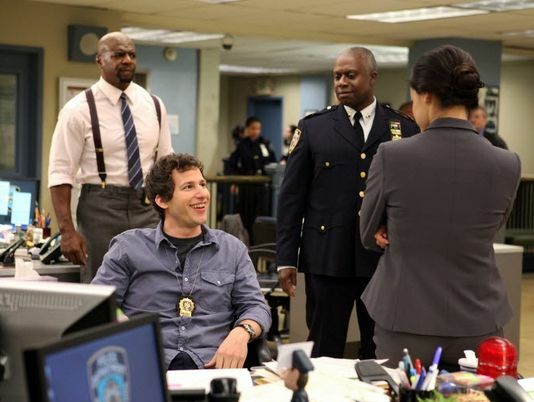 Brooklyn Nine-Nine: Will You Be Watching? My husband and I are looking forward to this show and will definitely be watching it! It looks hilarious and we love the cast! This discusting person should not have a show, especially on Fox. The awful things he said about Mrs. Romney and Sarah Palin to mention only two, should be enough to keep this guy from making any money. I will not watch this show, and hope it fails miserably.